and you also get to watch 'alkistisTV' for free every week. "Virtues and character traits such as honesty, truthfulness, integrity, courage and industriousness that are enshrined, in The ALKISTIS Method®are all familiar values which the United Nations proudly represents on a global level." & you will automatically join the exclusive private mailing list, accessing 'alkistisTV' episodes each week. You try to manage everything but your thoughts are always racing, you feel short of breath, you have a gnawing tightness in your stomach, and sometimes, your afraid that you may even have a heart attack. You feel that you are stuck, a prisoner of your own life. You've tried self-medication, alcohol, smoking, and other things,m but those don't work. You can't stand the anxiety and overwhelm anymore. If you could only learn to be calm, confident and composed at will, this would make you ‘Take Charge’ of any situation successfully. You wish you could find a solution that works. Your life would change dramatically for the better. Outwardly, your calm, composed manner would help you find solutions, and focus on results, inwardly you would feel strong and free, the ‘Master’ of your destiny. You would have Self-Leadership. 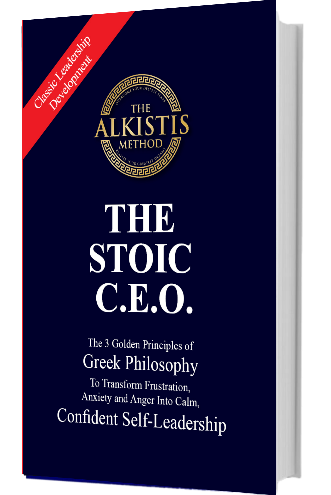 ​Hello, I am Dr. Alkistis Agio, and for over 20 years, I have been coaching top executives to overcome frustration, anger, anxiety and overwhelm. To TAKE CHARGE of themselves.